San Francisco is quickly adding residents, but very few cars. Between 2000 and 2012, the city has seen a net increase of 11,139 households, and 88 percent of them have been car-free. That’s according to an analysis of U.S. Census data by Michael Rhodes, a transportation planner at Nelson\Nygaard and a former Streetsblog reporter. One net result of this shift is that the proportion of San Francisco households who own zero cars increased from 28.6 percent in 2000 to 31.4 percent in 2012, the fifth-highest rate among large American cities. The stats show that the city’s average car ownership rate is declining, even as the population is growing. The data don’t distinguish where specific households are foregoing cars, so this doesn’t necessarily mean that the residents of all the new condo buildings going up are car-free. But the broader effect is reverberating throughout the city, whether car-free residents are moving in where car-owning residents previously lived, or residents are selling their cars. “A lot of people who are moving here are choosing it because it’s a place you can get around without a car,” said Livable City Executive Director Tom Radulovich. “People will self-select. If convenience for an automobile is their criterion, there’s a lot of places in the city and elsewhere” to live. Radulovich noted a number of changes in the 21st century that have made it easier not to own a car. San Francisco has expanded its bike lanes, car-share services now exist, and taxi service has improved (besides the new “ride-share” apps like Uber and Lyft). Muni, BART, and Caltrain ridership have also increased to record levels over the years. And, Radulovich noted, even the new wave of tech workers tends to get to work on shuttles — unlike those in the dot-com boom of the 90s, who favored living near highways 101 and 280 so they could easily drive to Silicon Valley. “There’s a lot of people who get to work on the tech buses — those might’ve been car owners a decade ago,” he said. Across the country, Americans are driving less, and millennials in particular are generally more interested than earlier generations in car-free city living. Radulovich pointed out that it’s often older residents who insist that the city build more free parking (see: Prop L). “There’s definitely a set of cultural expectations, from those raised in the ’50s and ’60s, for car ownership and automobility,” he said. Even among the 12 percent of new households since 2000 that do own cars, many are car-lite — not each individual owns a car. SF has actually seen a net decline in two-car households despite growth in total households, while the number of households with three or more cars increased by slightly more. The statistics show the efficacy of providing better alternatives to car ownership, but they also underscore the importance of building more housing in walkable, transit-oriented neighborhoods throughout the Bay Area. Your analysis of his analysis is not good. He looked into households without cars, not the total number of cars. You’re looking at completely different numbers. Also, unlike the Census data, the fact that a car is registered in a city is no proof that it actually resides in that city (e.g., my license is for a neighborhood in Seattle but I currently live in LA). And for the record, if you check the actual 2012 data that he linked to you’ll see that the margin of error is less than 1 percent. Another key point is that from 1960 to 2000, car-free households declined from 42.1% to 28.6%. 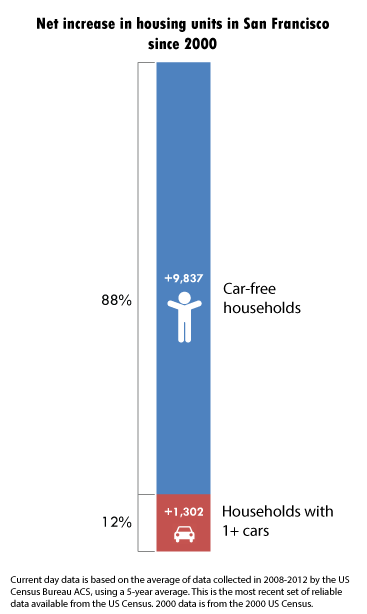 Each decade in that time we lost a large share of car-free households. The fact that we have stopped that trend since 2000, and have even started to reverse it and inch back upwards, is huge. There is also a huge demand for streets to safely accommodate cyclists and pedestrians – setting up a resource allocation issue that will inevitably, if not immediately, be decided in favor of a noncar-centric transportation model. If you have any doubt that this is not the case, try to find a single developer who has had to offer units at a discount because they do not have multiple parking spaces. I can’t find anything that shows the fine is different if the car isn’t registered in the city. I see the fine as $74 for everyone. How much is it for out of city people? there were 2 additional RPPs created between 2008 and 2012 but considerably fewer permits issued. That would argue against it being a factor that causes people to be more likely to register their cars. I can’t vouch for the site. It seems to be against the RPPs. Perhaps you have other data to cite. The joke is that if you have permit and therefore are registered to your address you don’t get a fine in an RPP zone. The fine is zero if you get your sticker. Which you can’t get if you don’t register your car at your house. here were 2 additional RPPs created between 2008 and 2012 but considerably fewer permits issued. Interesting. Maybe once the neighborhood went RPP, people who didn’t want to pony up the $109 per year finally cleaned out their garages. That wouldn’t explain an overall reduction in RPP applications, would it? I’ll second this. Earlier this year I reregistered my car at my SF address to get the RPP (previously it had been registered in SoCal). At the same time our “household” went from having two cars to one, so the net was one less car, rather than the plus one that DMV data would show. Where in SF are there $7/hr meter rates? How many hours per month does the typical resident pay that rate? There is no proposal on the ballot for a VLF increase, and even if that proposal does land on the ballot, it might not pass. All this adds up to a pittance. A $500M transportation bond does not make it more expensive to OWN a car. A transportation bond is not paid back by people who own cars, it is paid back by *everyone*, through property and sales taxes. If anything it makes it LESS expensive to own a car by fixing potholes and reducing wear and tear on cars. Meanwhile rents and purchase prices for housing – which represent a much larger percentage of the cost of living – in the city have doubled in the past decade. Let’s put it this way – if any given resident of SF could have a choice between paying more at meters, Sunday meters, residential meters, an increased in VLF – or having their rent cut in half, which would they pick? Each on-street spot costs taxpayers $400/year to maintain, yet most street parking remains free. In RPP areas, residents pay a quarter of the cost. Taxpayers pick up the rest. The only time there are ever $7/hr meter rates are right around AT&T park during games – and clearly that’s the right price for those times…but that’s not going to stop anyone from pretending that it is common throughout SF. In RPP areas, residents pay zero percent of the cost. The money collected for RPP’s are used to administer the program, not maintain the roadway. M Rhodes has difficulty showing his analysis to the readers. Good job A Bialick, advertising a report that does not exist. Michael has gone to quite some lengths here to show you the numbers, and cited exactly where they came from. Are you saying that you expected his analysis to come in the format of a published report? Apparently your argument at this point is that it’s not, and therefore the numbers and analysis are bunk. People started asking questions about the analysis. Then you and M Rhodes begin damage control. Twice I asked where is M Rhodes’ analysis available for reading. No reply. But that was too difficult for M Rhodes. M Rhodes’ numbers and analysis are not good. M Rhodes cherry picks a lower estimate that results in an increase of 11,139 housing units. Then he tries to make his case. You advertised M Rhodes’ analysis that is not visible for anyone to read. Do you always have to use smoke and mirrors? Can you admit that his analysis does not exist? @JJ94117 – 2 such incidents in the last 24 years, possibly longer. But since Bucchere is pretty much the only argument some people have, we can be assured to hear his name used as Ye One True Exemplar of Bicyclist Misbehavior for the next 24 years. It was never proven that he ran a red light. He claims he entered on the yellow, which is legal. Not even close to true. When someone steps into an automobile and turns the ignition, they immediately pollute the air around them. This pollution kills 60,000 Americans annually. And then when they go into the street, they transfer risk to the people around them. Someone in an auto is far more likely to injure or kill a pedestrian, cyclist or fellow car driver than someone on an automobile. Like an order of magnitude greater. So no, they are not similar at all. Everyone driving a car threatens the safety of and injures the respiratory system of everyone around them. Very few cyclists do the same. It is great that people are being priced out of car ownership, if that is in fact happened. People should not be driving in a dense urban area at all. I know it will take a while to get there and that some people have to drive in the meantime, but we should be discouraging automobile use as much as possible. I oversensationalized the graph in my head when I saw it. After reading, I’m not surprised at all. We can discount suburbanites but they are a part of the city’s economy, working and playing here, and they often need to drive. GG Park users fought the deYoung Museum’s underground parking garage; can the museum survive without visitors from our metro area? I moved to SF in 1977, partly because I wouldn’t need a car. I now own one, but tend to walk in my own little neighborhood. I realize that I am privileged and pity those who must drive. How did that Prop L vote turn out for you sebra?